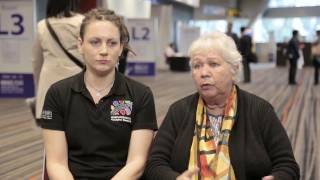 Roslyn Weetra, an Aboriginal Elder and cancer survivor, discusses her experience with cancer being a member of the Australian aboriginal community. She was diagnosed with non-Hodgkin’s lymphoma and required hospital treatment. At the beginning of her treatment she mentions not understanding what some of the medical jargon meant, as well as difficulty in understanding how the cancer was going to impact her. Referring to her aboriginal culture, cancer treatment, including chemicals and non-traditional healing remedies, was an uncomfortable scenario for her. Ms. Weetra also mentions there being a lack of information that she could access at mainstream hospitals. Jasmine Micklem, PhD, of the South Australian Health and Medical Research Institute, Adelaide, Australia, follows on to mention that the aboriginal cancer care coordinators play a key role in helping people navigate the system, however, they are not always available at all of the hospitals. This can become a difficulty, especially for those living in remote areas where English may not be their first language. Recorded at the Multinational Association of Supportive Care in Cancer (MASCC) and International Society of Ocular Oncology (ISOO) 2016 Annual Meeting on Supportive Care in Cancer held in Adelaide, Australia.